Katherine “Kathy” Maria Cannon Barnell, 61, of Rincon, Georgia peacefully went to the loving arms of her Savior on Monday, December 3, 2018. She is preceded in death by her mother, Helen Cannon; father, Frances Cannon; and brothers, Willie and Tommy of South Carolina. 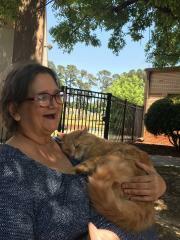 She is survived by her daughters, Amanda Hinely (Casey) of Guyton, Georgia, and Pamela Smith of Rincon, Georgia; granddaughters, Amberleigh Driggers, Kacey Driggers, Daisy Stone, Brianna Stone, and Brooke Hinely; 4 brothers, 3 sisters, and 3 cats. Visitation will held at Riggs Funeral Home on Friday, December 7, 2018, from 11AM until 12 noon with services to follow at noon in the chapel of the funeral home. Interment will be held in the Rincon Cemetery.